I'll admit to having a love-hate relationship with these. They are of marginal quality (although the die-casting has improved recently) and unfortunate design (the adjustability is limited to four discrete positions). However, I do find the design and shape of the actual rest which sits upon your thumb to be quite comfortable...especially with a thin cork covering. I have also been suspicious of the strength of these, but I have never seen one fail. I recently decided that I would address the adjustability issue, because it is really the only material issue with these that I can identify. The existing screw solution is a thin thumbscrew with a slot, OR a screw with a straphook. Both have a cylindrical base that 'fixes' the adjustment to one of the four positions. This is necessary because the screw and strap hook are both pretty lousy to adjust. They are, however, just standard 3mm metric screws that require a precision length to engage the maximum # of threads without scarring the clarinet body. I discovered that the panel-fixing thumbscrews on many electronic boxes are also 3mm threads. I searched around and found a very suitable alternative for virtually no cost; the ones I chose are black-anodized aluminum and they need to be filed a little shorter to leave 5mm of thread remaining; I chose aluminum so it would be easy to file. If you look at the attached picture, it shows the screw alone and in the application. This enables continuous adjustment with very solid tightening capability with the fingers and, if I do say so myself, is more attractive than the original equipment. Thank you for finding this solution! I believe the slotted screw encourages the use of a big, fat screwdriver, which encourages over tightening, which causes (or had caused in the past) the cracking of the thin adjustable part of the thumb rest. As for "comfort," there is the ProTec Gel Thumb cushions and they are the best accessory for clarinet I've found in years! Of course they add some space and may cause you to adjust your thumb rest up another notch if you have one left. If you consider the threads stripping as "fail" then I've seen more than a few. Both because of the material and because the threads are unnecessarily short. More often than not the screw side is the problem, but sometimes both sides strip. Common problem and the reason many repairers don't like these. Yes I have repaired numerous of these stripped threads. As post above says it is almost always because the screw is far too short and only engages on the last couple (of already tapered) threads. My fix was to drill a clearance hole into the body about 3 mm deep and fit a decent longer screw. I seem to recall that one of the Jupiter brass sax guard screws, slightly modified, made a very good replacement. Take a look at the picture in the OP...these start out at 8 mm, and I just screw them all the way in (before install or in a non-installed thumbrest assembly) and then file them to clear. This gets you the maximum engaged thread without having to drill the body. Also, you only have to loosen it 1/4 turn and then slide to the new position with precision. The original locking screws exert an outward force on the sliding section so that will cause it to break. A much wider screw with a flat underside (as seen in the original post) which sits directly on top of the rails of the adjustable section will transmit the force straight down instead of outwards, so that's much better all round. Other makers have a similar design (Yamaha and Jupiter as well as some Chinese clarinets), except for Buffet. Isn't it funny how Buffet like to go long term with a flawed design - it's a wonder they discontinued the E11F push-fit pillars after such a considerably short time compared to other bad ideas that have gone on for decades. If I were designing an adjustable thumb rest, I'd use a ratchet system with very narrow teeth on it. I need a full half inch of lowering, and for the time being use a conveniently suitably sized piece of styrofoam with a thick rubber band. I recently got one of these from Amazon for less than $9.00 https://goo.gl/gxjmWb It appears to be made of much tougher metal than the pot metal used by Buffet. Screw holes, however, are in a different position; it has a neck strap hook and lacks any callus padding. The screw usually strip first, but changing to a longer and better one can eventually cause the other side to strip, which (from memory...) is also made of mazak. Some of the models have a ring on the screw for a strap and quite a few players use that. A few times I've made new screws with rings since the alternatives would either not have the ring or be just another short mazak replacement screw. I'm wondering if anyone else has at least rough estimates of what % fail? I don't even have a good guesstimate... but it's definitely enough to show a design flaw. "I recently got one of these from Amazon for less than $9.00 https://goo.gl/gxjmWb It appears to be made of much tougher metal than the pot metal used by Buffet. Screw holes, however, are in a different position; it has a neck strap hook and lacks any callus padding." Yes, I saw the benefit of getting the Buffet one because there is no need to drill new screw holes. I bought a Buffet thumb rest from RDG woodwinds for $30. They claim it is an original one from Buffett. I did not want to buy a cheap imitations from Amazon or eBay. The tumb rest has been holding OK so far but I am not a pro and do not put so much pressure on it as I would if I played every day for a couple of hours. Also, I never used a coin to tighten it up, only finger tightened. Although simply replacing the adjustable thumbrest on Buffets is of no real benefit if you want it to be adjustable as they're still drilling the screw holes in the same location as the previous fixed thumbrests instead of drilling the screw holes around 10-15mm higher up the lower joint. Typical Buffet "carry on regardless" mentality. I always install these so that in the lowest position it is where the original fixed rest was...if players want it lower it is easy to add a rubber or cork pad, but this lets it go high enough for pretty much anyone that I have provided one to, and with an aftermarket screw it is continuously adjustable. > with an aftermarket screw it is continuously adjustable. It's that simple - why don't Buffet change the numbers in their programming to drill the holes in a better location? Considering the majority of players want the adjustment to be made higher than the fixed location, it only makes sense, only that's gone out the window. Interesting to hear that perspective from across the Pond. I always felt that the thumb rest position was determined by the prevailing European approach to playing. Or perhaps the "traditional" European approach to playing. Do the French all let their thumb sag or droop below the horizontal? Buffet have been fitting their fixed thumbrests in the typical location for fixed thumbrests on the majority of clarinets, only when they switched to adjustable ones across the board more recently, they just screwed the baseplate in the existing holes instead of repositioning them to give more adjustment both upwards and downwards instead of only downwards. Whenever I add an adjustable thumbrest to any instrument, I set the sliding part so there's equal adjustment up and down and then line the lower edge of the thumbrest where the original one would be, mark the position of the screw holes then drill them and screw it in place. Typically that positions the baseplate around 10mm or thereabouts above where the original holes were drilled. 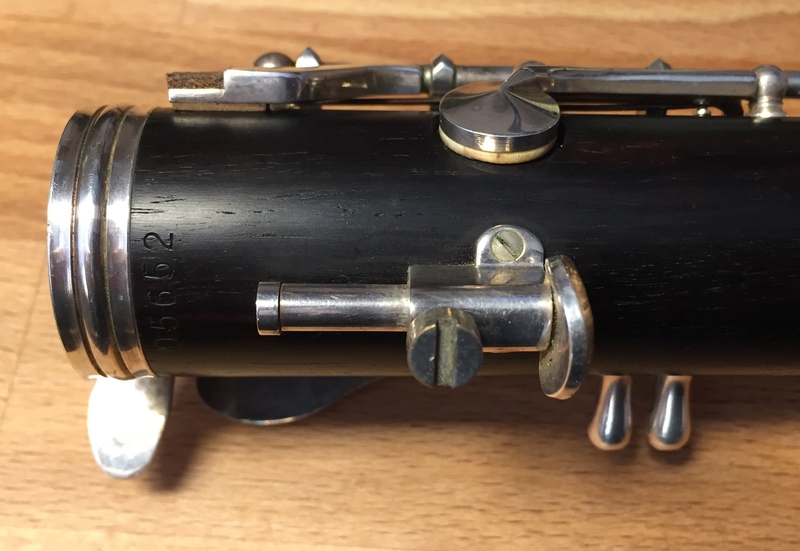 The strangest adjustable thumbrests I've seen were the ones fitted to Selmer 10G clarinets from the '80s where the plate was angled in such a way that it didn't suit everyone whereas the usual and equally curved plate is much better. The older Buffet Prestige-style one wasn't particularly comfortable either unless it had a contoured cork pad fitted to it. Ah, but as far as Buffet is concerned, is that because they feel the "standard placement" is an upward limit (again, because they allow their thumbs to relax downward), or simply engineering laziness? Possibly having more French customers, I wondered if you have a broader exposure to the issue through European players. This is on a top-of-the-line Yamaha Custom CS clarinet...factory thumbrest.